As your child moves into the first grade, you’re going to notice a lot of changes. School is going to stimulate your son’s mind in new ways, and the toys you buy must do the same. In fact, toys should take a more active role in your child’s development at this point. Ideally, he’ll augment what he learns at school. This goes beyond the development of mental skills. Your six-year old is now socializing with more children his own age. Thus, toys that encourage group play are excellent choices for your six year old boy. Also, any toy that helps your son develop physically will go over well. Choose the right toys, and you’ll help your son develop his emotional, social, mental, and physical skills. I’ve spoken to several parents of six-year-olds to find out what toys they buy for their sons and why. Here’s a selection of 20 toys that I think will help your six-year old’s development, without losing that important fun factor. Every kid loves playing dodgeball. It’s a fun game that gets your child active, while also helping them to develop their hand-eye coordination. With Diggin’s toy, you offer your child the chance to play dodgeball safely. The package comes with a couple of mesh shirts, which your child can adjust to fit his body. 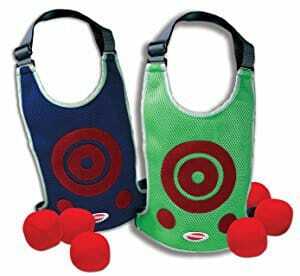 These shirts contain a Velcro target for other players to aim at. When the ball hits the target, it sticks, making it easier to keep score during the game. What's Great About It: The Velcro target idea is great, as it means your six-year old can easily keep score during dodgeball games. Dodge Tag gets your child playing with others, and helps to develop coordination and team-based skills. The winner of a Preferred Choice Award from Creative Child Magazine, the Stomp Rocket Ultra could be the perfect choice for boys who have expressed an interest in science. The key to this toy lies in its simplicity. It includes a foot pump, and four rockets with foam tips so you don’t have to worry about head injuries. Your child places the rocket into a stand and jumps on the pump: the rocket shoots up about 200 feet into the sky. The act of jumping on the foot pump helps your child develop their coordination and leg muscles. I wouldn’t recommend using the rockets for games of catch, though. Even though they’re foam-tipped, the rockets still pack a punch, and your child may misjudge their flight and get hit. There are also some small parts, which could present a choking hazard to younger children. What's Great About It: You can use the Stomp Rocket Ultra to introduce some basic scientific concepts to your six-year old. It’s also just plain fun. What six-year old boy doesn’t enjoy jumping on something as hard as he can? Almost every little boy loves robots. There’s something unmistakably cool about having a toy that you can control. 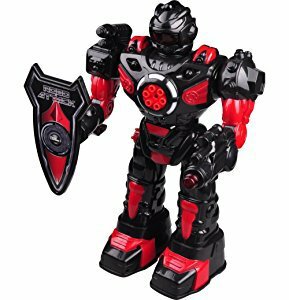 Think Gizmo’s robot puts the power in your son’s hands. He’s almost certainly going to to love it. The toy comes pre-loaded with a bunch of phrases. It’ll greet your son as “master” whenever he turns it on, and has several warning phrases for when it prepares to shoot. It also has a couple of foam discs, which it can fire at the touch of a button. The fun little dance feature only adds to the package. Be warned, though. The toy eats batteries like nobody’s business. It needs six AA batteries, which don’t come with the package. If your son gets attached to this toy, you may end up spending quite a lot of money on batteries. As a long-term solution, I recommend you to use rechargeable batteries. What's Great About It: The robot can walk on practically any surface, and it will quench your six-year old’s thirst for action. He’ll love taking it on search and destroy missions. A lot of six-year-olds start showing an interest in the mechanics of how things work. Toy cars are always a popular choice, but you may want to go for something your son can actually build himself. 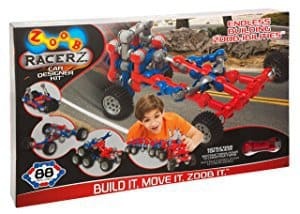 ZOOB’s car designer sets are popular because they challenge the mind, while being quite simple to use. This set comes with 76 pieces, which your child can use to build three cars or one huge vehicle. The set comes with instructions that, despite their simplicity, require attention. This is great for getting your son started with the set, but it’s the potential for creativity that really sets this apart. As your son gets more comfortable with how everything fits together, he’ll be able to build cars of his own. Of course, he can also use his creations in the same way as a traditional toy car. What's Great About It: Boys start developing critical thinking and creative skills as they get older. The ZOOB set challenges both of those areas of development. It gives your child something to learn about, before giving him the chance to come up with his own designs. Darts is a fun game, but the sharp metal points of adult darts present a risk to children. You probably don’t want your six-year-old throwing those around. With the Marky Sparky set, you can eliminate this risk. 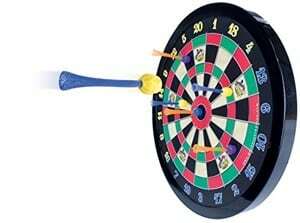 The set comes with a magnetic dart board, and two sets of three darts. Naturally, this encourages social play, and will get your son’s competitive juices flowing. Safety is always a priority here, but what really impressed me was the quality of the magnets. Marky Sparky uses neodymium, which keeps the darts flying accurately, while making the whole kit very light. However, that light weight can also work against it, especially if you’re too concerned about the aerodynamics of kids’ throwing toys. Also, it’s not the sturdiest of toys, as the board may break if your son gets too rough with it. What's Great About It: The toy teaches your son about competitive play in a fun way. It’s also great for developing hand-eye coordination. What’s more, you can use it as a teaching tool for basic mathematics. 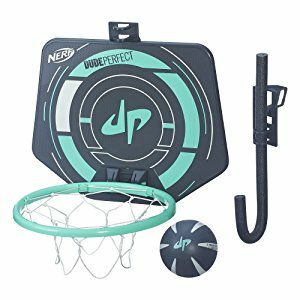 I mentioned physical development earlier on, and I think Nerf’s basketball hoop is ideal for this purpose. It comes with an adjustable hanger, which allows you to hang it from a door or any other flat surface. This also means your six-year-old doesn’t have to struggle with a hoop that’s too high for him. This is another toy that brings competitiveness and social play to the fore. It’s light, but also surprisingly sturdy. While your son won’t be able to dunk the ball, as this would snap the hoop, the set can stand up to plenty of regular play. Like most other Nerf-made products, it's quite sturdy and reliable. Basketball is also a great game for helping your child to develop his coordination and motor skills. What's Great About It: You can hang the hoop on almost any door thanks to the flexible hanger. It’s portable, and also sturdy enough to withstand repeated play. By the time he’s six, your son probably knows a thing or two about dinosaurs. 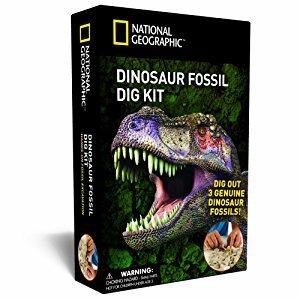 National Geographic’s kit offers him the opportunity to explore this topic, which is so often fascinating for kids. It comes with three dinosaur fossils: a bone, a tooth, and a fossilized piece of poo. Don’t worry about hygiene with the latter, as it’s basically a rock at this point. What I really like is that these are real fossils, rather than plastic recreations. It gives this toy a whole new dimension. The kit also comes with a handy learning guide, which teaches your son more about the fossils, and dinosaurs in general. The only downside is that it doesn’t really stand up to repeated play. Your son may get bored with digging up the same three fossils over and over. What's Great About It: This may be one of the best toys for a child who has developed an interest in dinosaurs. Your son can simulate the fossil-digging experience, while learning more about dinosaurs in general. Anything that challenges your son’s creativity makes for a great toy choice. That’s just what you get with Twister Tracks. The 221 pieces in this set allow your son to build up to eleven feet of track. Best of all, he gets to choose how the track aligns. The pieces are flexible, so your child decides where the corners should go. No two tracks will be the same, and your son can even build small hills and other landscape features into his creations. The set also comes with a toy car. The car’s rear light emits a neon glow, which trails the car when it’s running on the track. Of course, your son can also use any other toy car he has on the tracks. The set does require a couple of AA batteries, which unfortunately don’t come with the track. What's Great About It: Mindscope’s Twister Tracks will challenge your son’s creativity. They’re also easy to use. Plus, he can get a track built in no time at all. This toy is great for kids who’ve displayed an interest in cars. These binoculars may be a great choice if you want to get your six-year old out and about. In particular, they’re great for children who enjoy hiking, bird spotting, and other outdoor activities. 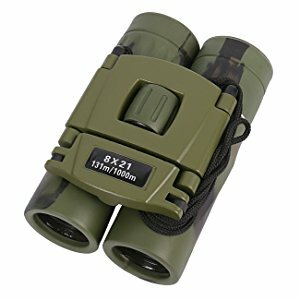 They come with 8x magnification, plus the binoculars have a handy little carrying case. This makes them ideal for young boys who go on camping trips and need to bring equipment with them. If your six-year old is part of a Boy Scout troop, these binoculars will complement the rest of his kit well. They’re adjustable too, so you won’t have to worry about eye gaps. Finally, the rubber eye cups offer a protective shield that prevents scratches and eye injury during use. What's Great About It: Portability is key here. The binoculars fold in on themselves, and have a useful carry case. You can pack them easily into a backpack, or your child can hang them around their neck with the attached cord. The magnification is great too. Magic offers you a great way to develop your son’s critical thinking skills. He’ll want to learn how the trick works, and will be delighted in fooling his friends once he’s mastered his new skill. A full magic set may be a bit beyond your son’s capabilities at this point in his life. But you can think of this flower pot and wand trick as a nice introduction into the world of magic. 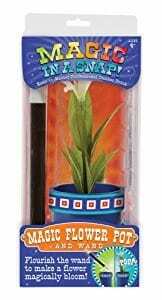 It’s easy to set up, plus it comes with some instructions and explainers that teach your child the true secret behind the trick. What's Great About It: The pot and wand offer an easy introduction to the world of magic. Your son will enjoy learning the secret behind the trick. He will then want to show it off to his friends and family. Every little explorer loves having nature adventures with his friends. 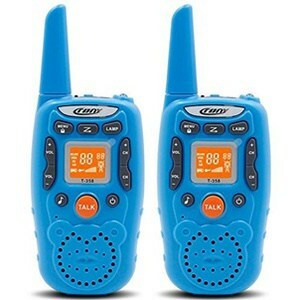 The Eoncore walkie talkies offer your son the chance to do just that, while staying in touch with his fellow explorers. They have a 1-mile radius, though this will decrease slightly if there’s a lot of plant life around to block the signal. The call tone choices are a nice feature, as they allow your son to customize his walkie talkie. The flashlight makes them great for nighttime play, too. You also get a choice between blue and pink, which could make these toys ideal for both boys and girls. What's Great About It: These walkie talkies encourage safe outdoor play. They’re more reliable than cellphones over short distances. Your son can share the other walkie talkie with a friend, or you can use it to keep tabs on your child when he’s out and about. Minecraft has become a phenomenon in recent years. It’s sold over 100 million copies, and is the videogame of choice for young creative types. If your son plays Minecraft, any toy bearing the branding should be a smash hit. 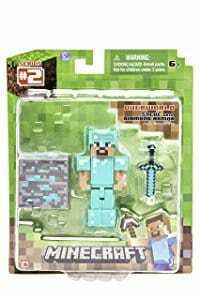 There are lots of Minecraft action figures to choose from, but I particularly like the Diamond Steve. It comes with a removable helmet, and a sword that fits into either of his hands. Your son also gets an ore block, which he can use to start building in real life as well as in the game. Honestly, almost any Minecraft toy could fill this slot. You could use this to start your son’s collection. Better yet, you can spur on his creative side with a toy from a brand that he recognizes. What's Great About It: Minecraft is huge among young boys right now, so they’re sure to latch onto any toy that bears the name. It also helps that this action figure is sturdy yet flexible. A lot of young boys are drawn to science when they start school, plus it always helps to give your son a boost in STEM subjects. 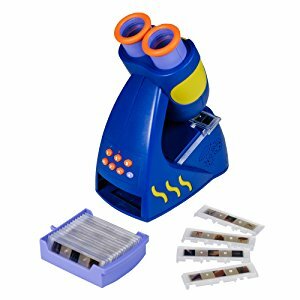 This talking microscope may fit the bill as a great education toy. It familiarizes your son to equipment that he’ll soon start using in lessons. Plus, it’s a great learning tool. The toy comes with a set of 12 slides, which your son can examine at five levels of magnification. The microscope talks too, offering up interesting facts about each slide when your child plays with the toy. The buttons on the toy activate an interactive quiz, which your son can use to test his knowledge. You will need a trio of C batteries to get it working, and they don’t come with the microscope. It’s also important to teach your son about the importance of handling the equipment delicately. One errant throw or tantrum could damage the microscope beyond repair. What's Great About It: The talking microscope allows you to get your child involved in STEM education from a young age. The range of slides keep things interesting, plus I like the quiz aspect a lot. It can prepare your son for the types of quizzes he’ll face at school. Every parent wants to encourage their child’s creative side. Tracing helps your child to develop basic motor skills, as well as to figure out how to compose images. This studio set offers 124 slides, each having a different image for your child to trace. It also comes with 10 pieces of tracing paper, though your son will go through these pretty quickly. I also like how the toy helps your child learn about using slides. The little drawer is a nice touch, as it gives your son somewhere to keep his paper and marker pens when he’s finished drawing. However, it does require three AAA batteries, which you’ll have to buy separately. 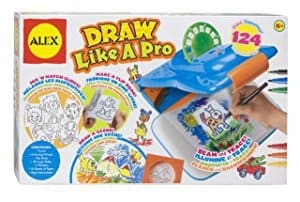 What's Great About It: The studio set will encourage your child’s creative side, and you can use it to help them to understand the basics of drawing. Over time, your son may also start adding his own creative flourishes to the images, which lends the toy longevity. A lot of six-year-olds fidget, especially if they feel bored or nervous. 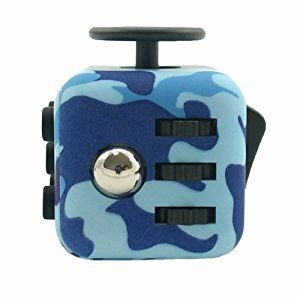 The Fidget Cube gives your child something to keep his hands occupied. It comes with six activities, including a joy stick for pulling, and a wheel. What's Great About It: The Fidget Cube keeps your child’s hands occupied, which helps those with anxiety or ADHD. There are no separate parts, so your child can take it anywhere without any risk. Most six-year-olds love blowing bubbles, but what if you could offer them something more? That’s what the WOWmazing kit excels at. Coming in three pieces, the kit includes a bubble wand, a bottle of bubble concentrate, and an instruction manual. I particularly like the manual. It doesn’t just tell your child how to use the hoop properly, but also packed with tricks your child can learn on his own. Your son will love showing off his new skills to his friends, plus he’ll hone his fine motor skills in the process. 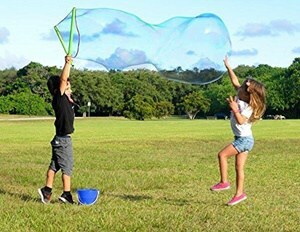 This makes the WOWmazing Kit one of the best toys for outdoor play. Your son will need plenty of open space to enjoy it, though. What's Great About It: The instruction manual features plenty of tricks. These keep your son interested, while helping him to develop his motor skills. It’s also great for helping shy children make new friends. Sometimes, it’s the simplest toys that can offer unlimited fun. 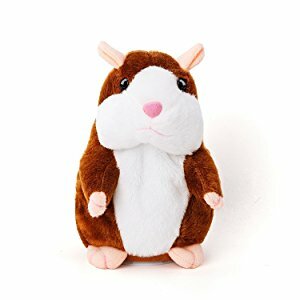 This talking hamster is hilarious when it gets going. Turn it on, and it’ll repeat anything your son says to it in a funny voice. It’s pretty interactive, too. The head bobs up and down whenever your child pets it. It also makes for a great cuddly toy for the nighttime. A word of warning, though. Make sure you turn it off at night. Remove the batteries if you have to. Otherwise, you may find that it starts mimicking any sound that it hears. You also have to avoid alkaline batteries. They have a high current that could damage the toy’s inner workings. What's Great About It: This is a toy that emphasizes fun over everything else. I love the high-pitched voice. Your son will enjoy saying funny words and getting them repeated back at him. 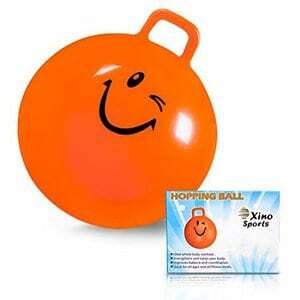 Available in blue and orange, this hopping ball can be a great toy for children who need to develop some strength in their legs. Through hours of play, your son will develop physically, without even realizing that he’s exercising. The ball stands at 22 inches tall, and can hold up to 170 pounds in weight. As long as your son takes care of it, the toy should last for several years. The strong handle makes maintaining grip easy. However, falling is a distinct possibility. As a result, you should not allow your son to play with it on hard surfaces. Using a helmet and kneepads is optional, but recommended for extra safety. What's Great About It: The hopper is great for building your son’s physical strength. It works the legs and core. It may also be a great choice for those who want to get the most out of their toys. The high weight limit means your child could use it for several years. Your six-year-old’s reading skills will really start to develop in the coming years. He needs a bit more time to figure out how language works, and to start learning more sophisticated words and using them as his own. 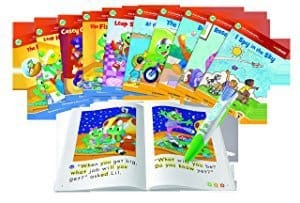 LeapFrog’s book bundle allows your son to get a head start on his peers. It includes 10 books, each of which covers a different subject. I really like the interactive element of this toy. The set comes with a pen, which your son can use to scan over unfamiliar words. The reader then says the word, which makes this a useful learning toy. You can also buy more books, as the pen works with any book in the LeapReader range. The set does need a lithium battery, though one comes included. If it runs low, you should be able to get a replacement from a watch shop. What's Great About It: This set is a great early reading tool. The fact that there are more books available, can keep it interesting for your child in the long term. The reader also means your child can learn essential reading skills on his own, as well as with you. Board games help your son to develop his logic and memorization skills, in addition to providing you with the opportunity to enjoy some family time. Of course, it also helps if the board game is educational. 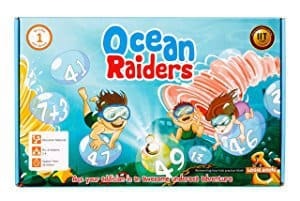 Ocean Raiders challenges your son to learn basic mathematics so that he can find a hidden treasure. Addition is the focus here. Your son will work with both single and double-digit numbers. With extended play, you should see him develop more speed in his mental arithmetic skills. I particularly like the poster that comes with the game. It makes a great addition to the bedroom wall. What's Great About It: Ocean Raiders combines fun with learning. You should see your child’s mathematical skills develop through play. It also uses non-sequential numbering, which further challenges your child. Your six-year old’s development will rocket along as he goes through the first grade. He usually develops a thirst for knowledge, so any toy that you buy needs to quench this thirst. Of course, you can’t forget about the importance of fun, either. If your child doesn’t enjoy playing with the toy, he won’t learn anything from it. Toys that develop motor skills come to the fore at this age. Your son’s fine motor skills are developing, so anything that encourages him to draw or get physical will prove beneficial. Numerous toys aim to teach players about spelling, vocabulary, mathematics, sounds, and a lot more topics that contribute to literacy. Apart from school, toys and play can introduce different forms of knowledge to children. Puzzles and boards are just some of the numerous toys that can provide such learning. Your son is spending a lot more time around children his age now that he’s in school. Any toy that encourages group play should make for an excellent choice. Remember that your son is also growing increasingly independent. He’ll start making choices about who he spends time with, and may start to resent too much adult supervision. His toys should encourage him to play with others, while being safe enough for unsupervised use. Six-year-olds want to do things, and start thinking more about what they’re doing. Your child should enjoy any toy that helps him to unleash his creativity, or challenges him to solve problems. You should also consider your son’s physicals development. The Centers for Disease Control and Prevention (CDC) recommends that developing children get an hour of physical play every day. Ask yourself what you hope to achieve with the toy before buying. For example, your son may need to develop a particular physical skill. Alternatively, school may unveil subjects that he struggles with. A fun toy that focuses on the difficult subject may aid in your child’s development. My list includes toys that focus on different areas of your son’s development. Take some time to think about which toy will benefit him the most, in addition to being fun for him. The opportunity for your son to explore his creative side. Portability, so that he can share his toys with his friends. An interactive element. Ideally, the toy should do different things depending on how your child plays with it. Toys play an important role in your child’s development. A good toy will encourage your son to move away from the television and start playing with others. It should also reinforce the skills that he’s learning, now that he’s in the first grade. Quality toys should help your 6 year old son develop bonds with his peers, as well as with his family. Keep track of your son’s growing interests, and choose a toy based on the things that he enjoys the most.